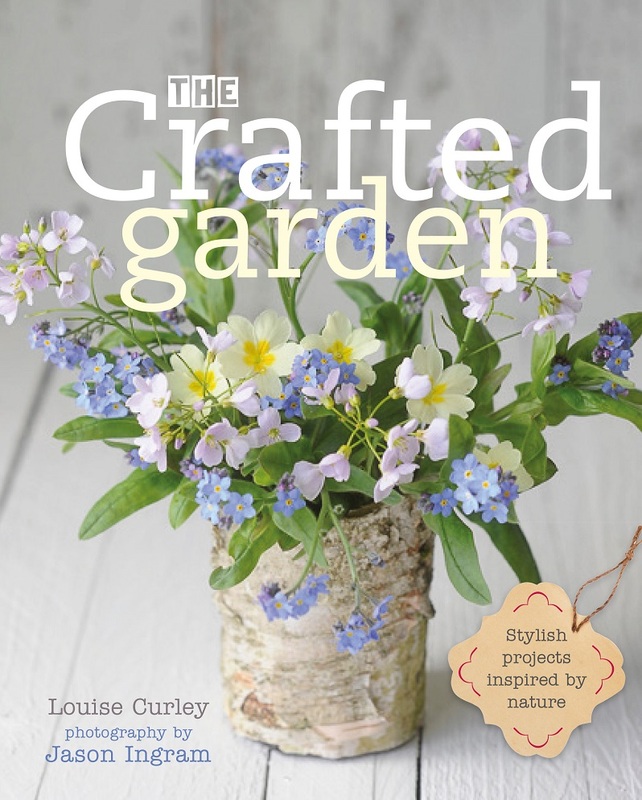 Lovely to read about your cutting patch. I planned to get one started this year but what with the extremes of weather progress has been a bit lacking. Your lovely pics have inspired me to get on with it! Hi Clare, It has been a difficult year. I felt like giving up at one point when I couldn’t get anything to germinate but things have improved so much in the last week or so. Thanks, Flaneur. Less lawn and more flowers, that’s what I say. Although I know you’ve probably had enough of digging. Once you’ve got the ground prepared and if you sow hardy annuals direct into the ground a cut flower patch is quite easy to maintain. Although it’s surprising how time consuming the dead-heading is!! But yes, no more large-scale digging for the foreseeable future for me. I love my garden, but I love my back even more… It will be much easier to get stuff done in the garden once my husband returns, though; it’s so much more fun to do heavy work when you’re doing it with somebody else. Hi Flaneur, A bad back can be so debilitating, so as little digging as possible sounds good to me. I managed to get hubby to move lots of barrow loads of manure at the weekend, which is one of my least favourite jobs. It certainly makes it more enjoyable to be able to share the work and the sense of creating something together. My trouble is that I’m probably stronger than the Flâneur Husband… So I tend to take the heaviest chores, but I guess that wouldn’t have been a problem if I had had somebody there to do all the carting around of soil and compost so I just had to dig it. 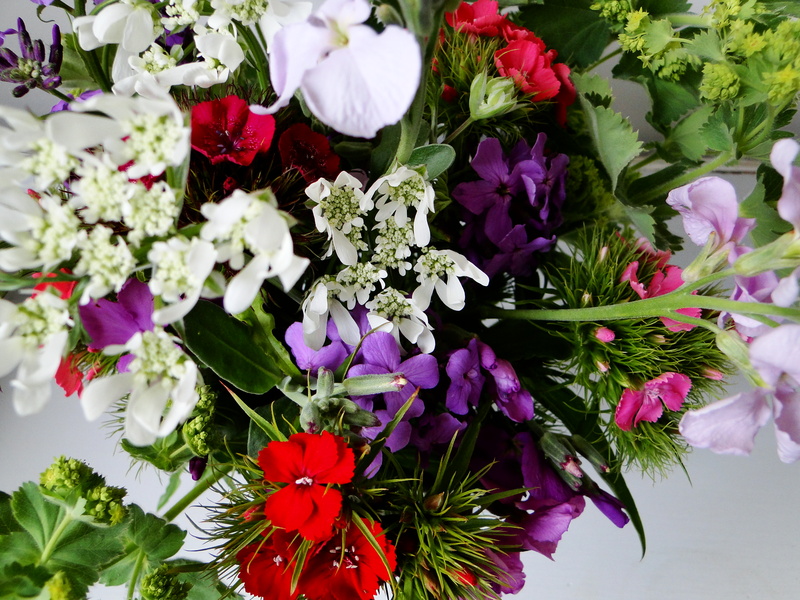 Wonderful colour combinations in your cut flower posy, you certainly are organised with your sowing! I’ve always said that I prefer the flowers in the garden, but I think you might manage to convert me!! Do watch that alchemilla. With me, it spreads and seeds everywhere. You can have too much of a good thing! Cut it hard back immediately after flowering to stop it seeding. It’s quite tough enough to come away again rapidly. 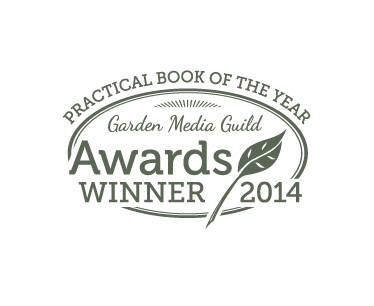 Hi Garden Correspondent, Thank you. I love having flowers in the house but was reluctant to pick them from the garden, didn’t want to end up with bare patches, that’s why I ended up devoting some of the allotment to them. That way I don’t feel guilty and I can snip away. Your cutting garden sounds wonderful. Your Sweet William is beautiful–one of my favorite flowers. Pbmgarden, Thank you. 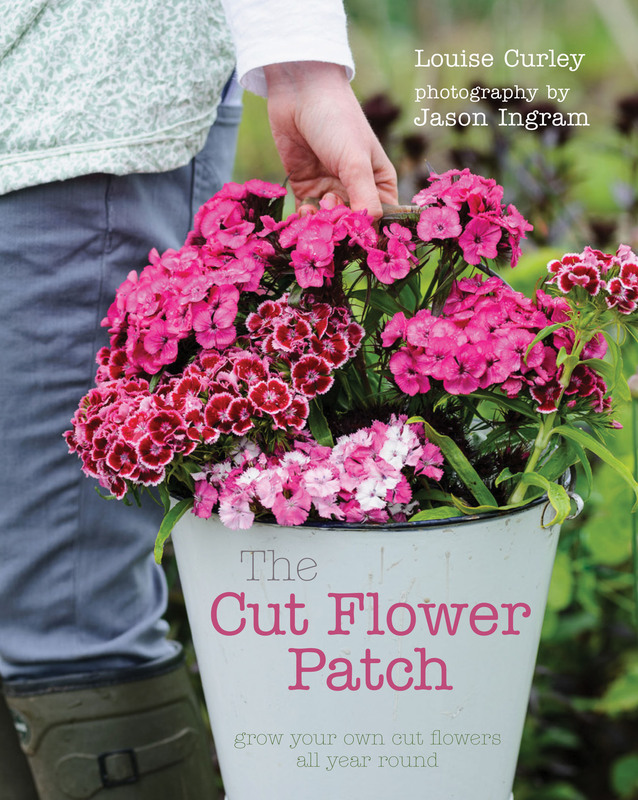 I love sweet williams but they seem to have fallen a bit out of fashion.They are perfect cut flowers, with a lovely scent and they last up to 2 weeks once cut. Donna, I really appreciate the comments. Sweet williams are one of my favourites. I’ve got such a massive patch of them, I’m not sure what I’ll do with them all. A vase in every room, I guess. You are an allotment trend-setter! Hi Lyn, I’m not sure that’s what some of them would call me!! There are a couple who think flowers shouldn’t be allowed. It’ll be nice to see a bit more colour at the allotments and a few more bees buzzing around. Dave, There’s plenty of time for the dark sweet william seeds. 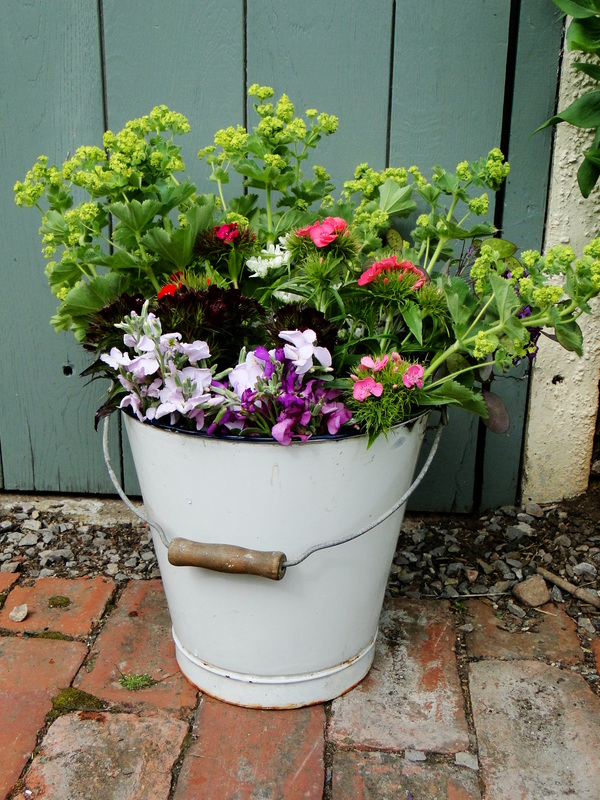 The best time to sow them is in June or July to flower next spring. So don’t despair, WW. I bet your house smells wonderful, and looks cheerful too with all those flowers in it. I’m full of intentions every year to create a flower patch, but it just never seems to come off, I’m just not organised enough. This year I was planning on direct sowing seed to cut down on the work but with all the rain we’ve had, I haven’t even dug a patch over yet. Oh well, I might manage to grow a few flowers for the house, we’ll see. Hi Jo, A small bunch of the stocks especially can fill a whole room with scent. It has been a difficult year. Very few of my direct sown seeds have worked. I’ve had to frantically resow in trays, indoors. Some flowers aren’t going to bloom until much later in the year but sometimes there’s not much you can do about the weather. What lovely flowers! I have a teeny tiny cuttings patch in the kitchen garden which is doing rather nicely, though am reluctant to cut them down as they look so nice!! Lunacy I know. I sowed my Amni Visnaga and Majus last autumn, though may consider not doing that again, as they are towering above everything else. The lack of rain, heat etc, has not helped the others to catch up, but I’d prefer to see them all coming up in similar time frame. I am impressed you have so much in flower! I have been trying to run a cutting garden for a couple of years now and find it is weighted heavily towards summer proper. This is probably because I have a lot of annuals in it which I sow in spring. This year I had quite a lot of tulips specifically for cutting and that worked well for April and May. I wonder if I need to go in for more biennials or autumn sown annuals? Can you cut from your patch from spring right through? That is my aim but not as easy as it sounds! Love your posies, just perfect. Hi Elizabeth, I only have a small patch on my allotment so have small amounts of lots of different plants. My autumn sown annuals and biennials have all done well this year despite the topsy-turvy weather. I’ve been able to pick something every week since mid March, although only small amounts. It’s only been in the last 3 weeks that the quantity has gone up. Great to have your own flowers for cutting. The shop ones have such a heavy environmental cost…not to mind the financial one. 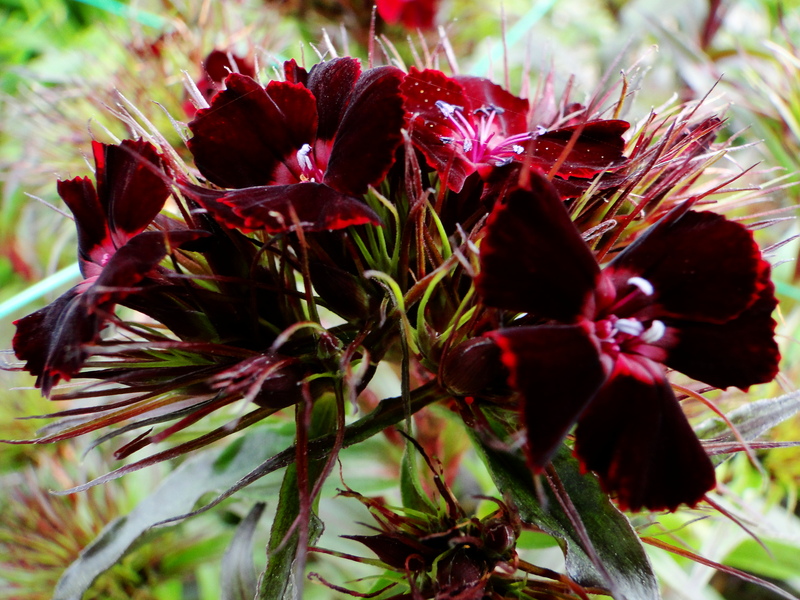 Loving those dark Sweet Williams. 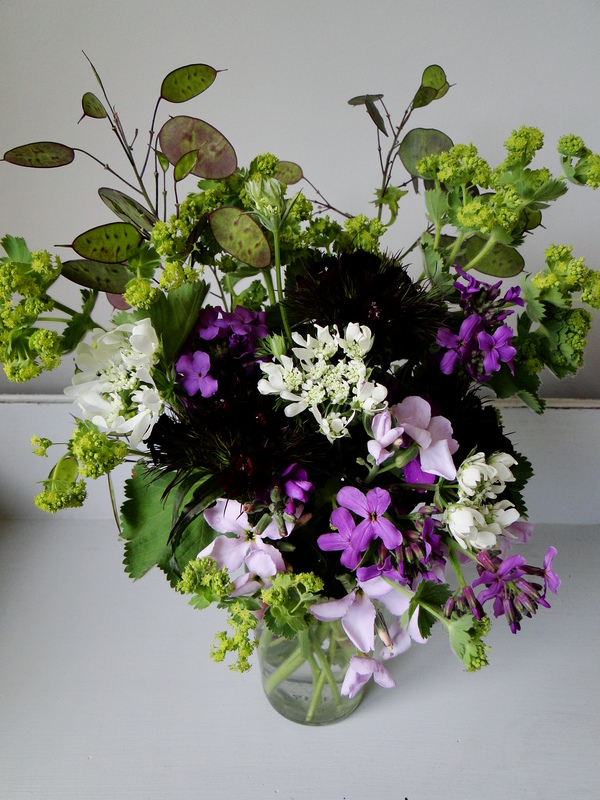 Bridget, I’m really enjoying being able to pick the flowers and sweet williams are one of my favourites.